Joe Kenny is a reporter for the St. Louis Review and Catholic St. Louis. Beats: Sports; Catholic social teaching: Crime and justice, immigration, missions, multicultural traditions; Catholic Charities federated agencies; Senior citizens and aging. Geographic areas covered: Parishes and schools in the South City, South County and Mid County Deaneries. “Tell Your Story” is the theme of this year’s Annual Catholic Appeal, which begins in parishes Saturday, April 21, and runs through Sunday, May 6. The goal is $14.2 million. The theme highlights the charitable works funded by the appeal and shows how ordinary people are greatly impacted by the generosity of Catholics in the archdiocese. 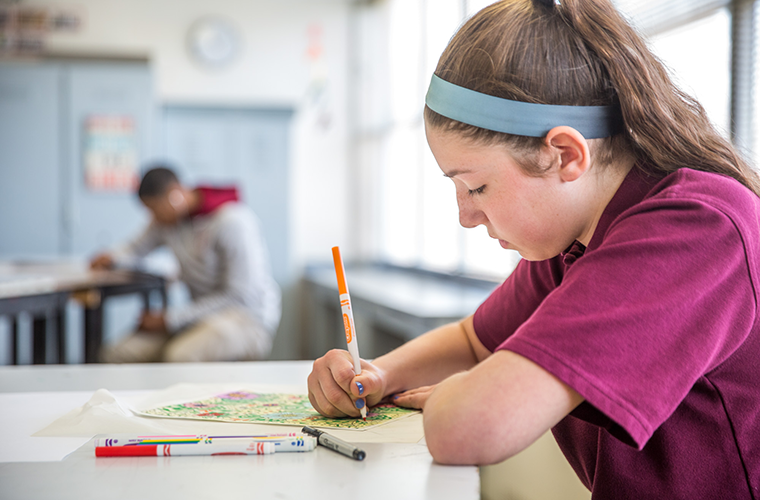 Paige Keller, a sophomore at Trinity Catholic High School, worked on a design exercise in her art class on April 5. Trinity Catholic has an enrollment of 337 and had more than $1 million in scholarship offers given to seniors last year. The school is supported by the Annual Catholic Appeal. Paige Keller used a variety of bright colors in her artwork — a delightful mix. Trinity is a “nice community,” a good group of students and faculty, she said, and she’s expanding her academic horizons in classes such as a computer class that has gone beyond the basics. Her art teacher, Tony Bodnar, encouraged his students to excel by designing a drawing using the concepts they’ve learned so far, including patterns, emphasis, movement, unity, balance and contrast. He presented examples, then moved from student to student, asking each questions to prompt them to think creatively. Meanwhile, in an Intro to Media class taught by Melissa Kennedy, students were involved in a layout and design project using computers. The class teaches the basics of video and print production. Kennedy, who teaches English and media classes, came to Trinity as a student-teacher from the University of Missouri-St. Louis and has taught at the Catholic high school for almost 15 years. Trinity, which this year has an enrollment of 337, had more than $1 million in scholarship offers given to seniors last year. The school offers 58 hours of ACC college-credit classes, and students are eligible for the A+ scholarship program to Missouri community colleges. At Trinity, 99.9 percent of students graduate. Funding from the Annual Catholic Appeal provides valuable support “to make sure we’re here, and we’re here to stay,” Kennedy said. 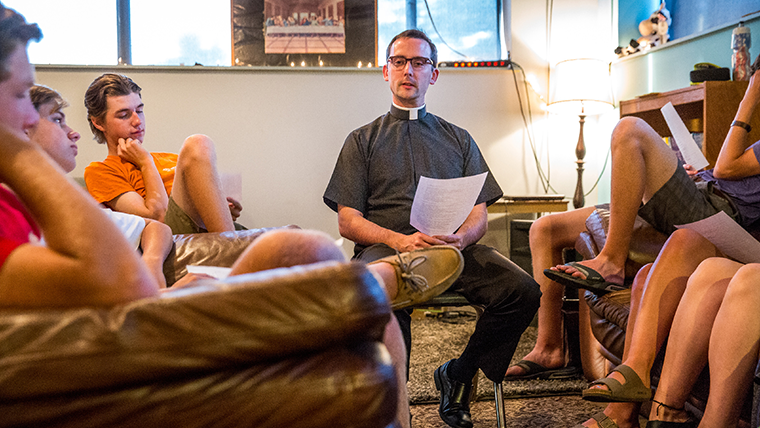 Transitional deacon Christopher Rubie led discussion at a youth group gathering at Immaculate Conception Parish in Dardenne Prairie. Deacon Rubie is scheduled to be ordained to the priesthood in May. Kenrick-Glennon Seminary is supported by the Annual Catholic Appeal. Deacon Christopher Rubie calls his time as a transitional deacon at Immaculate Conception Parish in Dardenne Prairie a learning experience that also is energizing. The Kenrick-Glennon seminarian was ordained to the transitional diaconate a year ago and is en route to priestly ordination this spring. The high school hockey player has a bachelor’s degree in philosophy and a master’s degree in legal studies from Webster University. He entered the archdiocesan seminary in 2014, which prepared him for parish work. He’s impressed with the teamwork and the collective effort parish staff members contributes to making Immaculate Conception a welcoming parish and quickly felt welcome there. “ICD has influenced me tremendously in seeing how a parish can be a ‘home’ for people as they journey in their lives together as Christian men and women. When a parish can be a ‘home’ for people of all ages — a place and a community where Jesus is encountered in the lives of His people — then Jesus is truly active and alive within a parish,” Deacon Rubie said. As a seminarian supported by the Annual Catholic Appeal, “it has been an absolute blessing for me,” Deacon Rubie said, citing “the tremendous generosity” of St. Louis Catholic families, who freely give their time, talent and treasure out of love for the Church. “I can say, along with my brother seminarians, a heartfelt thank you for all you have done, and continue to do for us,” he said. When she went through a divorce, Donna O’Donnell said, she couldn’t imagine any good coming from it or any way out of the struggles it brought. But she eventually healed and was determined to help others. O’Donnell approached then-St. Elizabeth Ann Seton Parish pastor Msgr. Robert Jovanovic about her idea for a program to help people recover with their faith intact or even deepen. She was prepared to make a hard sell about the idea, but he stopped her. He previously had invested in a program using authoritative sources on DVDs, which was tucked away in a closet, and was waiting for the right person to lead the ministry. The 12-week course from Ascension Press is based on the sacraments and Church teaching. Today, the archdiocesan Office of Laity and Family Life, which receives funding from the Annual Catholic Appeal, coordinates the Catholic’s Divorce Survival Guide course, a support group format to help separated and divorced Catholics find peace, power and renewed passion for life. The program includes 30-minute DVD presentations each week, covering topics of shock, denial, anger, grief, guilt, forgiveness and much more, as well as discussion opportunities. It’s known for its solid Catholic teaching and good results. The divorce ministry brings something good from something terrible, O’Donnell said. Many people turn away from the Church when they get divorced, incorrectly thinking that the Church no longer wants them, she said. The first step is to stabilize their emotions and deal with the shock, denial and depression. They need to take back the power in their lives by embracing forgiveness. “If we ask God for forgiveness in a part of our life, we need to offer it also,” O’Donnell said. People who experience the losses that come from divorce are encouraged to look at what’s really important — that heaven is our destiny, said O’Donnell, who trains facilitators for the course. 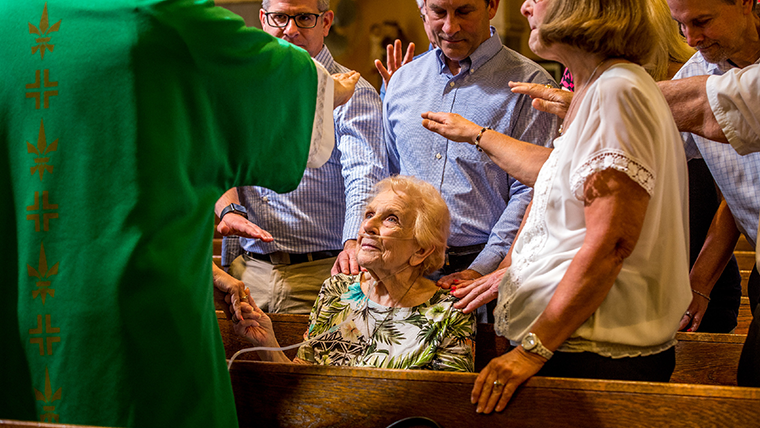 As her family joined in prayer, Margaret Vaporean received a birthday blessing from Deacon Allen Boedeker, left. Deacon Boedeker, whose formation was supported by the Annual Catholic Appeal, says he loves parish ministry. The permanent diaconate has allowed Deacon Allen Boedeker to have a dual vocation of marriage and ordained ministry. A couple of priests encouraged him to consider the permanent diaconate, and he was ordained 21 years ago. A full-time theology teacher and sacristan at St. Louis University High School, he is in parish ministry and served liturgically in a number of capacities in the archdiocese. He has a master’s degree in theological studies from St. Meinrad Seminary and helps deacon candidates, “walking with them their first year through their classes. I get to sit through those classes so I get refreshers,” Deacon Boedeker said. The Annual Catholic Appeal has been instrumental in funding the many educational efforts of the diaconate program, he said. The Appeal also supports the lay formation program, which currently includes a parishioner from St. Andrew Parish in Lemay, where Deacon Boedeker is the administrator. He recently was contacted by a woman in the parish who’s had what he called “experiences of movements of spirits.” He put her in touch with the Catholic Renewal Center, which deals with unexplained occurrences caused by a lost soul, or what some might call a ghost. He said there’s pronounced occult activity in his parish, including at an abandoned school, and Deacon Boedeker does several house blessings each month. Deacon Boedeker came to St. Andrew Parish in 2001. He is involved in the Rite of Christian Initiation of Adults program, helps with the Parish School of Religion and arranges for priests to do sacramental work at the parish.